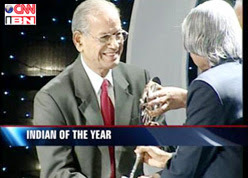 The verdict is out and the CNN-IBN Indian of the Year for 2007 is E Sreedharan. Metro Man Sreedharan, who was also the winner in the Public Service category, was chosen for achieving the near-impossible, for breaking through bureaucratic red tape and defying the naysayers of modern infrastructure-building to build the Delhi Metro. The 76-year-old Sreedharan is the Managing Director of the Delhi Metro Rail Corporation, its builder and executor. The Delhi Metro has proved to be a Godsend for the city as every morning, over six lakh Delhiites today use the network to commute to work. Sreedharan faced numerous challenges. Bureaucratic red tape tried to delay his work. Contractors would not meet commitments. Corruption threatened to slow him down. But the unassuming railway engineer never lost hope and never stopped believing in his project, which changed the face of urban transport in India. With 56 kilometres of the network on track and only two more phases left to be completed, the $2 billion project is running ahead of time and strictly within budget. In just two more years, the high-speed train will be accessible to every resident of Delhi.